Image of a FPT Marine engine. EVAPAR is a full-service provider of Power Products. We offer a number of power solutions to include FPT Marine Engines, and Emission Control Systems. The range of FPT marine engines covers applications for light, medium and heavy industrial vehicles. Our headquarters is in Evansville, Indiana. We have full-service branch locations in Louisville, KY, Indianapolis and Ft. Wayne, Indiana. Our service area covers the central and upper Midwest regions. At EVAPAR, we pride ourselves on exemplary service, high quality engines, and cost-effectiveness. 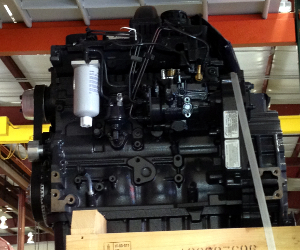 Inquiries about our FPT Marine diesel engine applications can be directed to our Evansville office. Please click here to fill out and submit a contact form. The range of FPT Industrial engines covers the applications for light, medium and heavy industrial vehicles and buses as well as industrial machinery (earthmoving and construction machinery, agriculture, irrigation and special machines). The five FPT Industrial Diesel engines families (F1, F5, NEF, CURSOR, VECTOR) feature some of the most advanced technological solutions present in the market: innovative architecture, multi-valve feeding systems, high pressure injection systems with electronic control (Common Rail and, for some versions, Electronic Unit Injector), efficient boosting systems with fixed or variable geometry turbochargers, also twin-stage, and sophisticated systems for emissions control. Please review the following pages for additional information on this world class line up of engines and accessories from FPT and EVAPAR. From 20 hp of the 4000 series to 825hp of the CURSOR series, FPT Industrial offers a complete range of products characterized by quality, superb features and applications versatility. The competitive performance shared by all engines – thanks to high specific outputs and high torque at low revolutions – is backed up by a drastic reduction of noise and vibrations to create the sensation of powerful yet extremely comfortable navigation. Low exhaust emissions and noise levels are ensured, without affecting performance or sailing pleasure. Engineering experience at FPT Industrial has culminated in compact, lightweight design with low volume/power and weight/power ratios, ensuring easier engine installation and boats’ superior efficiency. From 85 to 500 hp, the FPT Industrial range of marine engines was specifically developed for professional applications and is characterized by sturdy design and functional layout ensuring reliability and durability. The compactness of these products allows constant, efficient operation backed up by low running costs, thanks to much longer maintenance intervals and a drastic reduction in consumption. Thanks to high performance and high torques at low revolutions, boats achieve better efficiency even in the most demanding navigation conditions, without compromising the impressive life-span of the engine. The FPT Industrial range for Power Generation applications includes the F5, NEF, CURSOR and VECTOR series and has a wide range from 32 to 770 kW. In the range there also are several “hybrid” combinations, with various options available including a series of special products that can be adapted to satisfy even the most demanding of customers. Wherever energy is needed, FPT Industrial has the right solutions: banks, hospitals, malls and shopping centers, construction sites and shipyards, and also domestic use. The new range of soundproof gensets, both for rental or fixed installations, are environmentally friendly but at the same time offer great performance. The power generation range is enriched by some special products, among which we must remember 400 Hz units for airport and military applications, gensets in containers, specific shelters, energy systems for off-shore installations, low voltage distribution panels and resistances.